Coimbra (pronounced Queembra) is located between Lisbon and Porto. Its university is very old but most of its original buildings were destroyed in the major earthquake of 1755. The town is situated on a steep hill, although there is a significant part on the far side of the river Mondego. Patio das Escolas - a huge pedestrianised square with an 18th century clock-tower and two remarkably ornate buildings. Zoological Museum - just opposite the Science Museum and very undersung, this is a real gem. Sé Velha (Old Cathedral) - a good example of a fortified cathedral - some fine Romanesque architecture. Portugal dos Pequenitos - a theme park with miniatures of buildings from all Portugal's ex-colonies. Many of the 'pequenitos' (children) enjoying it are well into their 50's or 60's! Conimbriga - best Roman remains in Portugal. Vast area but little above foundations and wall bottoms. Bus trip. Forest of Buçaco - wonderful forest with a multitude of paths and a hotel like a palace (which you will not be allowed to enter unless you are staying.) Bus trip. Lousã - very scenic and cheap train ride with time to walk to the castle and the edge of the mountains - from Coimbra Parque Station. 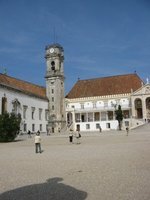 Coimbra has a small airport but international airlines use Lisbon Airport or Porto Airport. Coimbra B has a station on the main line from Lisbon to Porto. From there trains run a sort of shuttle to Coimbra A, which is in the commercial centre of the city. Tickets will be to the B station but the extra hop to A is included in the price. There is a long lift from just above the market to near the University Science departments. Use of the lift is included in any bus ticket with validity for a set time. There is also a bus from behind Coimbra A station to the University. There is a third station, Coimbra Parque, from where trains run to fairly close places, including Lousa, on the edge of the Serra of the same name and with a pleasant walk to a castle. The bus station is up Av. Fernão de Magalhães. To walk from anywhere near the station to the summit of the hill where the University Library is situated invlves a large number of steps and steep roads. Howevr the two cathedrals, old and new, provide stopping points for a rest. We have a comprehensive list of accommodation in Coimbra searchable right here on Travellerspoint. You can use our map to quickly compare budget, mid-range or top of the range accommodation in Coimbra and areas nearby. This is version 13. Last edited at 3:30 on Aug 2, 17 by sleepBot. 2 articles link to this page.